The famous chinese artist and activist Ai Weiwei has created yet another powerful piece art. This time it has to do with the ongoing refugee crisis. He recently opened a studio on the Greek Island of Lesbos, where many refugees have been arriving. His current work is about raising awareness about this crisis through his art. 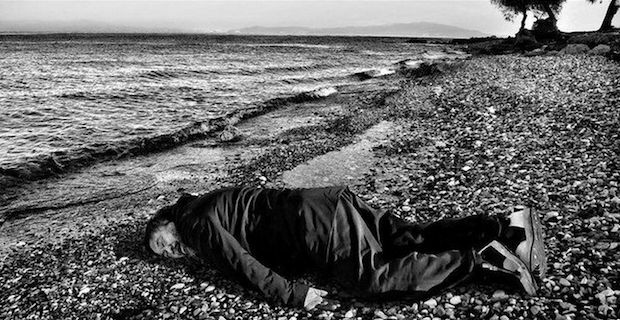 Photographer Rohit Chawla captures Ai Weiwei posing lifeless on the pebbles along the shoreline where many boats arrive. He was recreating the Syrian refugee toddler, Alan Kurdi, who was found washed up on the shore after the boat he was on capsized in September of 2015. This will be part of an exhibition at the India Art Fair according to Washington Post. While the Chinese government have imprisoned him, banned him from travelling for 4 years, and constantly monitor his whereabouts, Weiwei continues to be extremely influential. He was named the Most Powerful Artist in 2011 by ArtReview Magazine. Here are a few examples of some of his work. In 2008, Sichuan endured a horrible earthquake but the Chinese government were said to underreport the number of school children that died. Ai Weiwei then collected 200 tons of rebar which is reinforcement steel used in the schools. 90 tonnes of the twisted steel rods were then sent to be straightened by hand and then laid out to resemble a wave. The walls surrounding the sculpture had all the children's’ names written on it. He Xie translates to “river crab” and the Communist Party’s term for “harmonious” the way that they believe the society should be. It has since been used as a slang word for “censorship”. For one of his works he piled 3,000 porcelain crabs in a corner where they were unnaturally crowded and motionless. This artwork consisted of red glass crystal beads that made up a large chandelier that was lying on the floor. It looked as if it fell there but was still working. While in the 20th century the color in China symbolized progress and revolution, in pre-revolutionary times it symbolized pleasure, desire, luck and celebration. The chandelier shows how now it is the end of the party and celebration.